Our Fully Catered trips have a more relaxed feel as a motor boat (panga) escorts the group and transports all our gear from one camp to the next. This means that your kayak is light and of course, there is no need to pack and unpack it each day. As well as your kayak guides, you have a cook and cook's assistant, so while you are out paddling, hiking or snorkeling your next meal is being prepared and our crew takes care of all the washing up. Also, having a motor boat along means that we are able to take ice chests full of cold beer and other refreshing beverages. We are also able to offer a more flexible program. For instance, younger children may choose to ride in the panga to the next camping beach. We can also provide side trips to otherwise inaccessible snorkeling locations or go on a fishing trip to catch dinner. 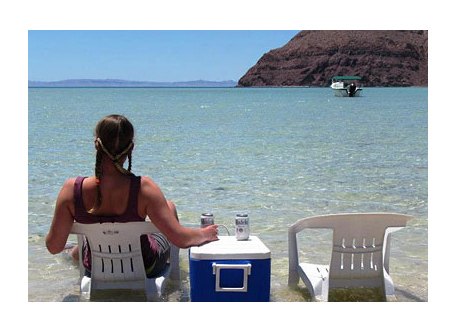 We can carry larger shades, tables and chairs so camping becomes a more comfortable experience. You will even have a solar shower to rinse off at the end of each day. Please note that we still require your assistance to set and take down your own tent and help loading and unloading the boat every time we change camp.